This book review was organized with Smith Publicity. I was provided with a copy of Captain LaPlank: The Perfect Pirate in exchange for my honest book review. All opinions are my own. “I’m not much for mistakes, and I mean that sincerely. Any pirate who makes one will pay for it dearly!” says new favorite pirate personality, Captain LaPlank. A cleverly written and beautifully illustrated children’s book launching on International Pirate Day, Captain LaPlank: The Perfect Pirate (September 19, 2018) entertains school-aged children while ever so subtly delivering a message around imperfection, leadership, and learning to live with mistakes. There’s no way around it… mistakes happen. Captain LaPlank: The Perfect Pirate, does a great job of pointing out that no matter who you are, you can make a mistake. Not only should you accept that people make mistakes (captains, crew… parents, kids, EVERYONE) you can make them yourself… and the world will not end. Captain LaPlank also gives a great example of how important it is to recognize when you’ve made a mistake, if you acknowledge and accept it, you can work to move on. While teaching a great lesson… Captain LaPlank is also a fun little read. Each crew maybe made their own little errors, and the Captain responded as pirates do (WALK THE PLANK!) and the story was told with sing-song rhymes. The books illustrations were also really cute. Definitely a fun book to add to your children’s collection, especially if you have a lover of pirates! Another fun thing…. visit the website and you can download a free coloring book version of Captain LaPlank! 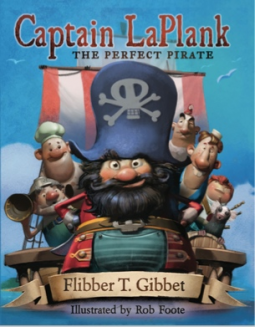 An emerging children's author inspired by Dr. Seuss, Flibber T. Gibbet wrote the whimsical cautionary tale of Captain LaPlank: The Perfect Pirate to inspire perfectionist parents to focus on embracing children doing the best they can, and perhaps they can learn a little something along the way too.